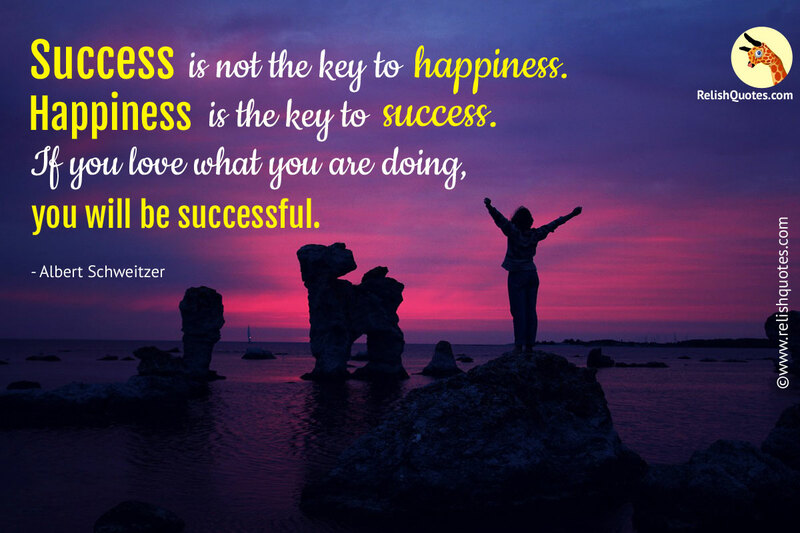 What does this Happiness and Success Quote teaches us? Success Quotes are nothing but keys to the doors of achieving the targets set in front of you. Albert Schweitzer advises you to use the Success Quote as a stepping stone to live your dreams and do all that your heart desires to. But the most crucial thing to remember on your path to success is not to kill the dreams, desires and happiness. It is happiness that gives you a chance to enjoy and savour the sweetness of your success. If you lose yourself, give up and succumb to the hardships, quit following your principles, in the process of achieving success, it is of no use. Losing your happiness to achieve success and prosperity is absolutely futile. Of course, be flexible and change your plans and strategies, to walk in sync with your plan. But that should not change and transform you completely. Do what you love to do, follow your passion and interests and success will come running to you. Have the courage and the guts to follow your heart, and do not give in to the rules and conditions that the world keeps in front of you. There is no way that you can be contented with false happiness that will come if you are a trend follower. Dare to set yourself apart from the normal crowd and do not be afraid to voice your opinions and be a trendsetter. True happiness will only come to you, if you pursue your work life in accordance with the interests you have developed. If you do not develop an interest in what you do, you will not be able to experience cent per cent satisfaction. Wait, and ask yourself, are you following your passions or merely running behind money blindly? The reply that your conscience gives will give you the ultimate answer, where your happiness lies. If you love your job, success will follow you wherever you go.